A dump truck is designed to transport loose material such as dirt, gravel or sand. It usually has an open-box bed with hinges on the rear end and hydraulic pistons on the front end. The pistons allow the operator to raise the front end of the bed, which dumps the contents onto the ground behind the truck. Dump truck beds, commonly known as dump beds, have traditionally been made from steel as this was the only suitable metal readily available. 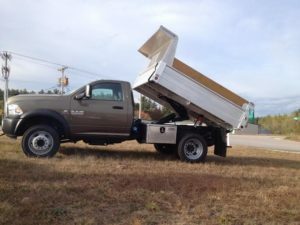 Recent advances in manufacturing technology have made the aluminum dump body commercially practical, which increases business efficiency over steel dump beds. All-aluminum dump beds entered the market around 2000 and are made of aluminum alloys, rather than pure aluminum. These alloys contain more than 95 percent aluminum, with copper, chromium, titanium and zinc comprising the majority of the remainder. The aluminum alloys used in dump bodies also contain trace amounts of other metals to provide the specific desired properties. Aluminum has a high natural resistance to corrosion and requires no special treatment to protect it from rust and other forms of corrosion. This property is aluminum’s most obvious advantage over steel. The type of steel used to make a dump body will begin to rust within the first year without protection. Some steel dump bodies are protected from direct exposure to the air with other materials to delay the inevitable rusting. This requirement generally involves coating the steel with a zinc layer, also known as a galvanic layer, by using processes such as galvanizing and galvannealing. The primary disadvantage with these processes is that zinc is not a particularly hard metal. Harsh weather combined with the abrasive materials typically carried by a dump truck will quickly breach the zinc layer, exposing the steel underneath. Galvanizing and galvannealing are also expensive, which reduces business efficiency. This expense makes it impractical to cover every surface of a steel dump body with zinc. Aluminum dump beds are much easier to maintain than steel beds. The metal itself requires no special care, and truck owners can usually clean the bed just by washing it with an oil-based cleaner. The only other significant maintenance for an aluminum bed is lubricating the latches and hinges. On the other hand, truck owners must constantly inspect a steel dump bed for signs of rust. They must promptly touch up any breaches in the galvanic layer to prevent rust. This maintenance requirement is especially high in areas with salty air, which accelerates the rusting process. Paint scratches are primarily a cosmetic issue with aluminum beds, but they’re a significant maintenance issue with steel beds. The lack of a galvanic layer also greatly simplifies repairs to an aluminum dump bed. A repair to a dump bed made of galvanized steel requires the technician to first remove the galvanic layer from the repair area. The actual repair can then be completed, which typically involves welding or riveting. After the repair has been completed, the repair area must then be re-covered with a galvanic layer. An aluminum dump bed is significantly lighter than a steel bed of similar strength, which increases the dump truck’s carrying capacity. Pure aluminum has one-third the weight of typical steel, but it’s also only one-third as strong as steel. These characteristics make it appear that aluminum and steel beds of the same weight are equally strong. However, this relationship ignores the fact that aluminum beds aren’t made of pure aluminum. The aluminum alloys used to make dump beds are stronger than pure aluminum, with the net result being that aluminum beds are at least 10 percent lighter than steel beds of the same strength. This difference increases the dump truck’s cargo capacity by the same weight, which increases the business efficiency of aluminum beds. An aluminum dump bed’s rust resistance also increases its resale value. Steel dump beds typically have noticeable rust patches, even when they’re only a few years old. In addition to reducing its cosmetic appeal, rust can reduce the bed’s cargo capacity. Rust can also present a safety hazard when it affects load-bearing components. As a result, aluminum dump beds almost always have longer warranties than steel beds.